HP's $200 Stream 11 has something to prove: that you can enjoy a small, cheap Windows laptop as much as users have enjoyed small, cheap Chromebooks for the past couple of years. The rise of Chromebooks for Web browsing and basic productivity has threatened the borders of Microsoft's Windows empire. The Stream 11 (and the Stream 14, its larger cousin), gives the company a chance to strike back: It bundles these low-cost laptops with a year's worth of Office 365 Personal (for the Stream 11 plus one tablet and one phone, normally $70 per year) and a $25 gift card to the Windows Store. A year’s worth of McAfee antivirus protection adds peace of mind. For the first year or so that you own the Stream 11, it’s a bargain. Small and cheap isn’t for everyone, of course. After using the Stream 11 for a week, its chiclet keyboard still feels cramped to me, as does the 1366x768, 11.6-inch screen. HDMI offers the only video-out option, so you’ll need a converter if you have an older DVI display, for example. And storage? Fuhgeddit. But let's be fair: I'd have similar complaints about like-priced Chromebooks. All I wanted to see was whether this bargain Windows machine was enough to keep me on Microsoft's side of the fence. The HP Stream 11 measures 11.81 inches wide by 0.78 inches high by 8.1 inches deep, and weighs 2.82 pounds. The Stream 11 notebook may be low-rent in components, but not in build. Measuring 11.81 inches wide by 0.78 inches high by 8.1 inches deep, and weighing 2.82 pounds, the Stream 11 feels solid, with a sturdy hinge—definitely more rugged than many Chromebooks I’ve tried (not counting Google's flagship Pixel, of course). Its fanless design is refreshingly quiet. You can buy the Stream 11 in two colors: Horizon Blue or Orchid Magenta. Inside the Stream 11 is an Intel Celeron N2840, a 2.2GHz dual-core Bay Trail-M Atom chip, and 2GB of RAM. While the 32GB of eMMC flash storage is fast, it's also meager—expect only 21.5GB of usable storage, with about 3GB taken up by Office 365. Just downloading the PCMark and 3DMark benchmark ZIP files, unpacking them, and then trying to download Windows updates in the background filled the available space. The Stream's USB 3.0 and USB 2.0 ports, plus the SD card reader, are therefore all the more precious. HP's Stream 11 has one USB 2.0 port, one USB 3.0 port, and HDMI out. While the Celeron chip is good enough for web browsing, I noticed definite lag when performing certain operations. When the system failed to respond immediately to my click on the File Explorer icon, I clicked again. Of course, that prompted two windows to pop up when the command finally registered. I encountered similar hiccups on occasion while browsing. I was able to open several tabs in Internet Explorer and surf normally, however. Just for kicks, I tested the system using the FutureMark Cloud Gate benchmark in 3DMark, generating a score of 1,262—about half as fast as a typical office PC. You won’t be playing anything on this beyond a Flash-based casual game. FutureMark’s more general office benchmark, PCMark 8.0, returned a score of 1,245 using the basic Home Conventional benchmark, an acceptable level for office productivity tasks. For comparison, the Microsoft Surface Pro 3 gives up about 2,138 in PC Mark 8's Home Conventional test. HP rates the Stream 11 at 8.5 hours of battery life, which I haven’t tested, but these Bay Trail-M Celerons do sip power. 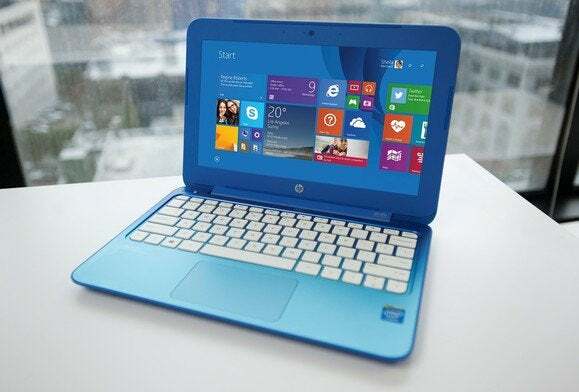 The HP Stream 11 comes in two colors: Horizon Blue (shown) or Orchid Magenta. The notebook connects to the Internet via an 802.11b/g/n connection—adequate, if not advanced. There’s no ethernet port, so make sure you have a fast router. Embedded in the lid is an HP True Vision webcam, which records 640x480 video. I’d normally be hesitant to recommend such a low-end Windows machine, for fear that “bit rot” would degrade the performance even more over time. I’m less concerned about that, however, than I am about the general bit-flation that will inevitably occur as more photos, cookies, apps, and digital detritus collects on the Stream 11's paltry flash storage. Buyers who don't want to become dependent upon OneDrive cloud storage will need to invest in external storage of some sort. I also have to believe that this chip, running Google’s simplified Chrome OS, would deliver smoother performance. The Stream 11 sits right on my line between a system I would endorse and one I wouldn’t. I still think that the odd performance hiccup will annoy you, and the lack of storage would tick me off quickly. But for someone who doesn’t buy the Stream 11 with inflated expectations, or doesn’t do a whole lot of futzing with their system, it might work out. Call it a “cheapbook.” Call it a simple machine for simple needs. I wouldn't call HP's Stream 11 a Chromebook killer, but it puts Windows back into the game price-wise, and that may be enough.